Are you ready for the first project for the Fat Quarter Series travel set? I am in love with this bag. It turned out so cute and it's big enough to hold all my toiletries while traveling. And I'm going to show you how I made it. 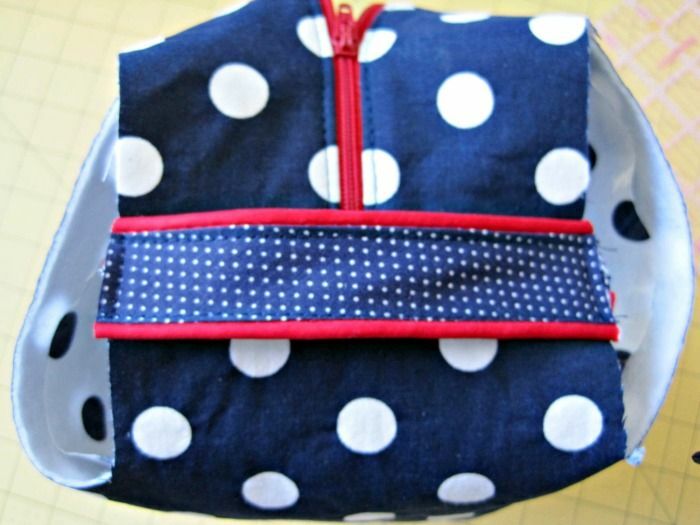 I got the idea for this bag when I saw a similar one from Sew Like the Mom. I loved the idea of using fusible vinyl. 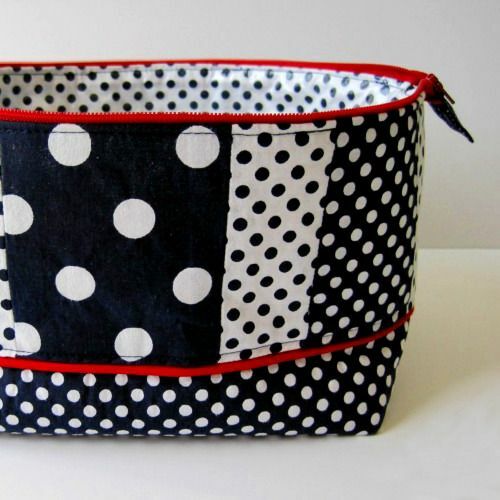 I had made a similar bag last year using rip-stop nylon for the inside, but fusible vinyl would mean I could use almost any fabric and make it water resistant (including cute fat quarter prints). Now I am going to show you how I made it. I tried to make this tutorial as beginner-friendly as possible with lots of pictures. 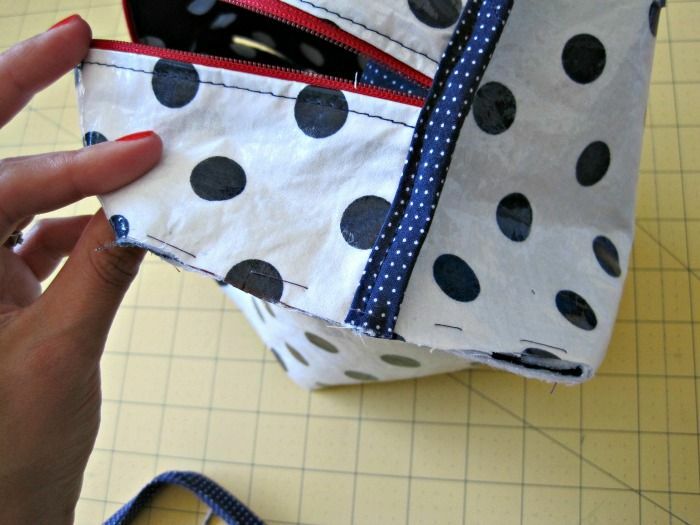 It's wasn't long ago that I was a beginner (I still feel like one on some levels) so I wanted to make the directions clear to follow even if you've never sewn with vinyl, made a bag, or haven't had a lot of experience installing a zipper. That being said, this is my first ever tutorial. So let me know it some part of it isn't clear! 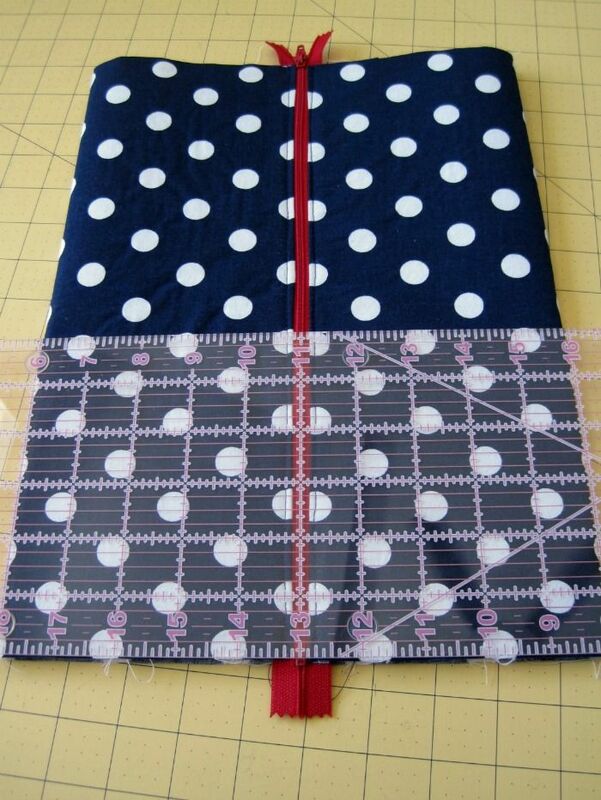 This project uses 2 fat quarters and bias tape made from another fat quarter. It also uses fusible vinyl. It sounds a little scary, but it's not! This was my first time using it too and it was so easy. The vinyl inside the bag help keep leaks from seeping out and ruining the rest of your luggage, and makes it easy to wipe clean. It also allowed me to use a white fabric for the inside (can you imagine how dirty white fabric inside a toiletry bag would get? ), which makes it a lot easier to see what's inside the bag. The finished dimensions are about 8" long x 5" wide x 5" tall. (My sample came out a bit smaller because my fabric shrank a bit..more on that below). UPDATE: You can see the cutting layout for all 3 fat quarter series projects HERE. First you need to pick your fabric for your bag. This is the fat quarter bundle I had purchased at JoAnn's. I already used the middle fabric to make the bias tape. I decided to go with the navy with large white dots for the exterior because the dark color will show less dirt. 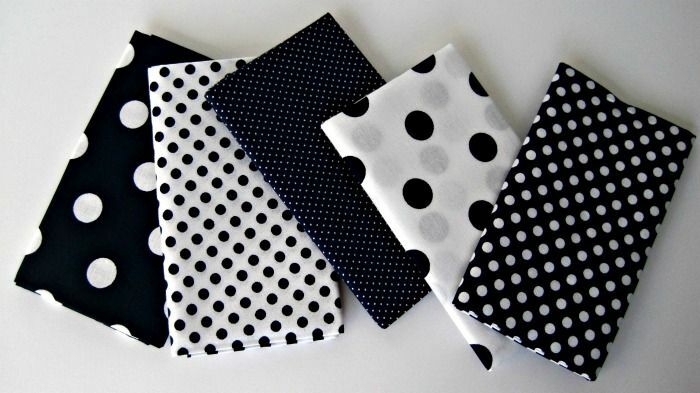 For a cute inverse effect, I choose the white with large navy dots for the interior. It doesn't matter that it's white, because the fusible vinyl will protect it from getting dirty. Cut off two 3" pieces of bias tape. Open up the bias tape along the folds, and place them right sides together. It helps to lightly iron it flat. Pin and sew along folds. Using a safety pin to help, turn the bias tape right side out. Press. Edgestitch along the top and bottom seams. Cut two 6" strips of bias tape and two 6" strips of piping. Unfold one piece of bias tape. Align the raw edge of the bias tape, wrong side up, on top of the raw edge of the piping. 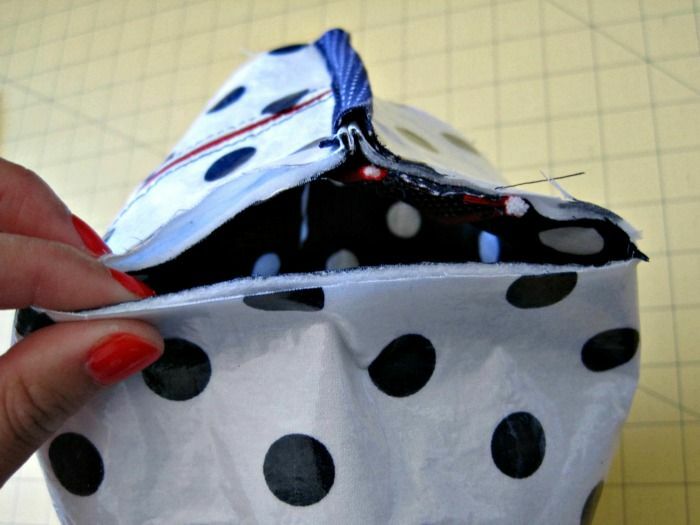 Using your zipper foot, sew along the fold crease, just under the piping. Repeat on the opposite side with the other piece of bias tape. 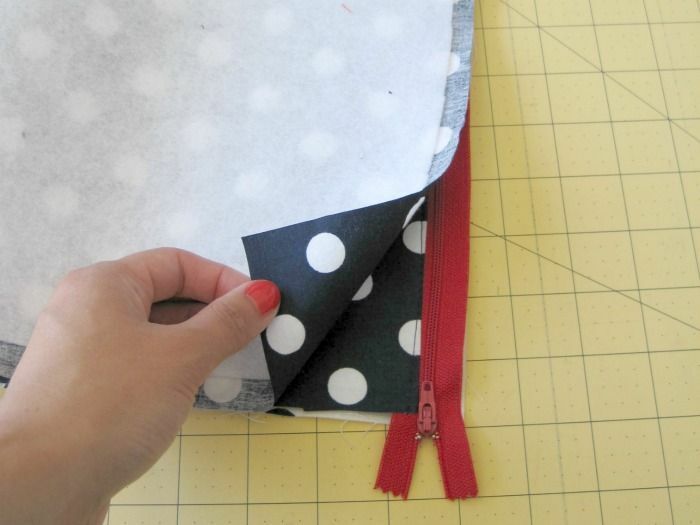 Re-fold the bias tape and press the piping outward. Lay the piece of bias tape with the piping wrong side up. Lay the other piece of bias tape right side up on top, in between the piping. Edgestitch the bias tape in place, close to the piping. Tip: If you want to assemble the handle without piping, I recommend using a piece of interfacing to stabilize the bias tape. 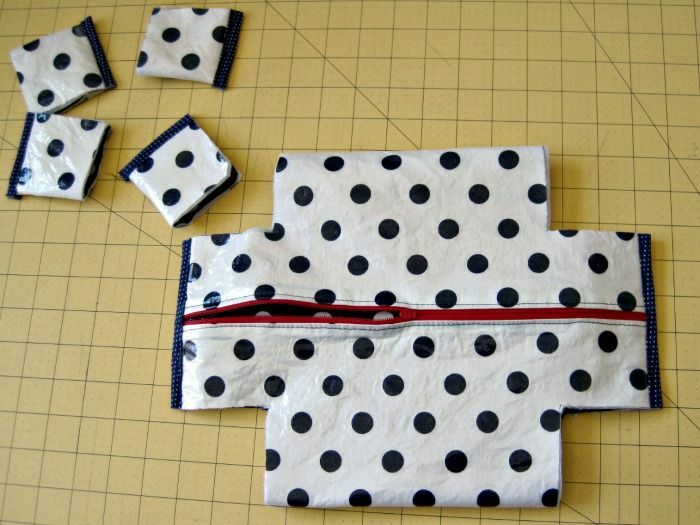 Then sew and assemble the two pieces the same way as the zipper tab. 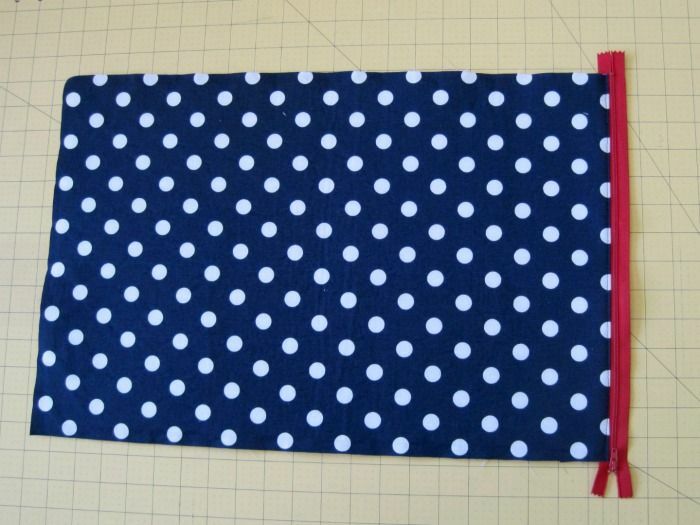 First, cut the fabric for the exterior (navy with large white dots in the sample). 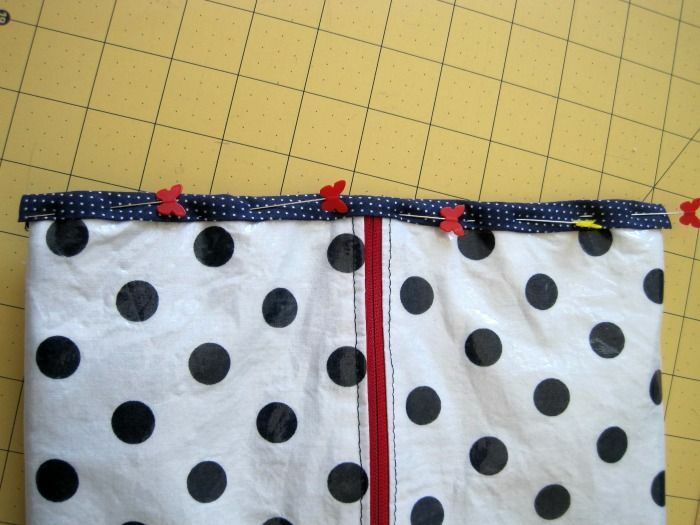 On the longer edge of the fat quarter (should be 21"-22"), cut off a strip of fabric that is 4" wide. 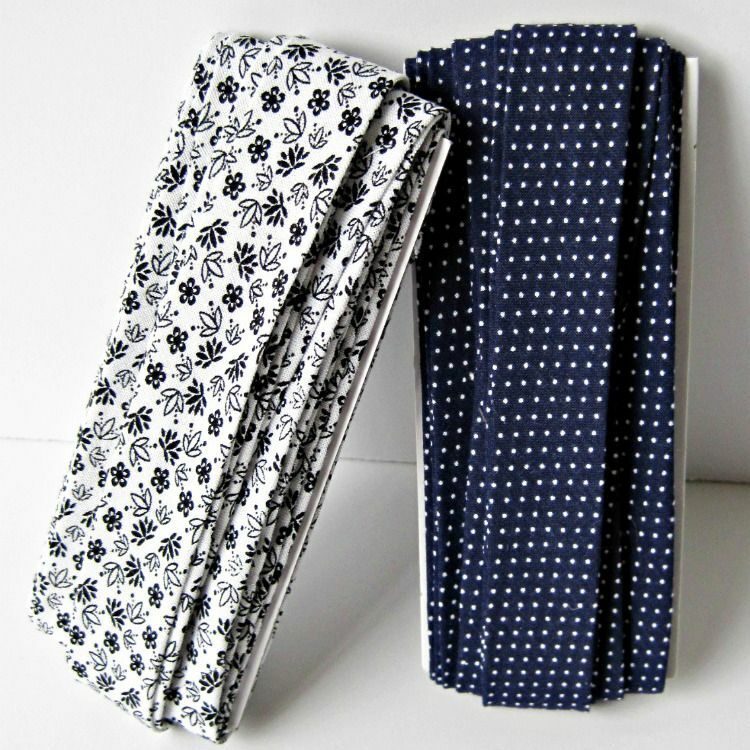 Set aside for later use (The 4" strip will be used for other projects in the fat quarter series). 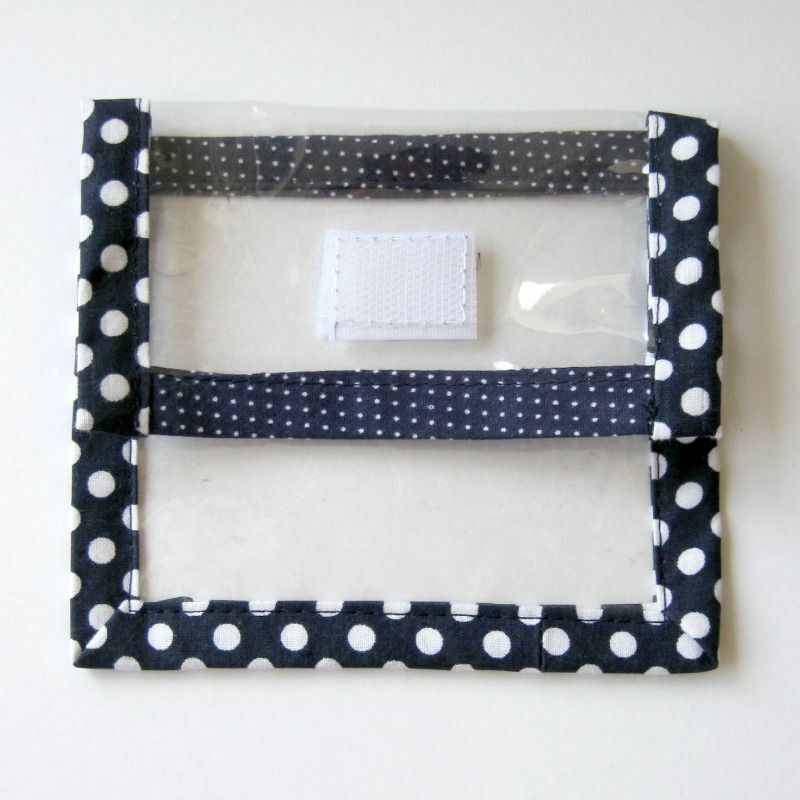 You should be left with a piece that is 14" x 21" (it's ok if it's slightly smaller/larger). 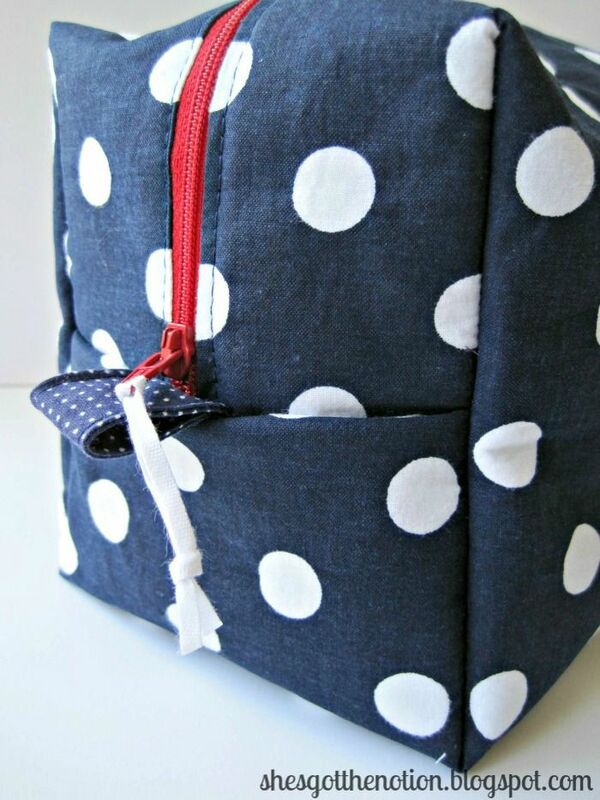 This will be the exterior of your toiletry bag. 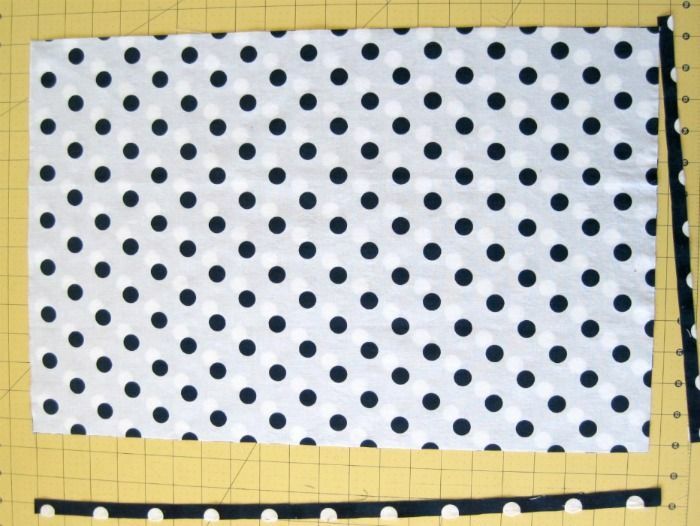 Repeat this step with the interior/lining fabric (white with large navy dots in sample). 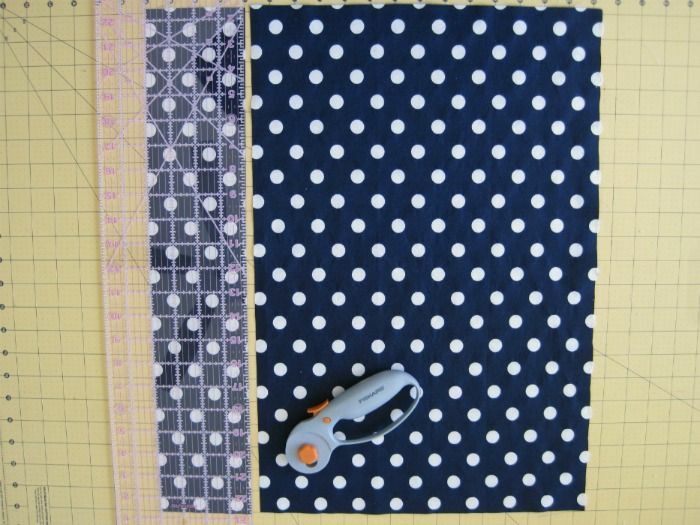 Note: If not using fat quarters, simply cut two pieces that are 14" x 21". Lay the interior and exterior pieces on top of each other to ensure that they are the same size. 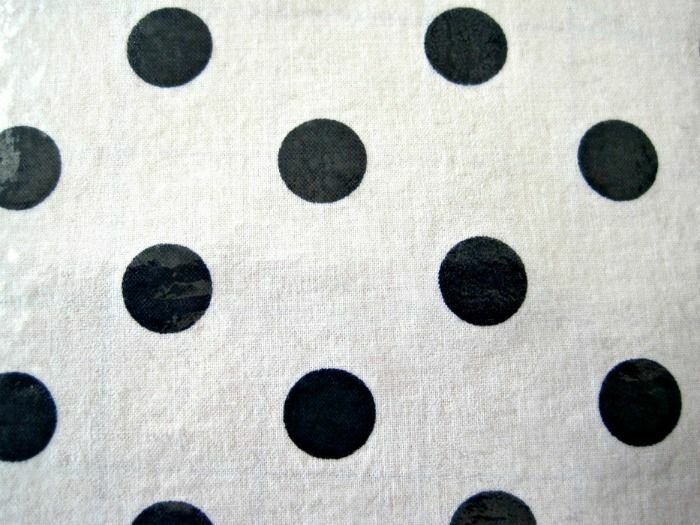 I prewashed my fabrics and the white fabric shrunk ~1/2". Cut off any excess so that the pieces are the same size. 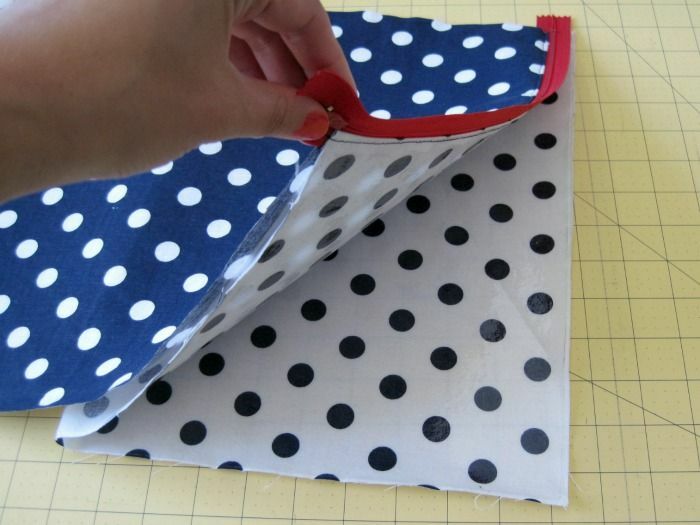 Cut a piece of fusible vinyl that is the same size as your interior lining fabric piece. Fuse to the right side of the lining fabric following manufacturer's directions. Instant vinyl! 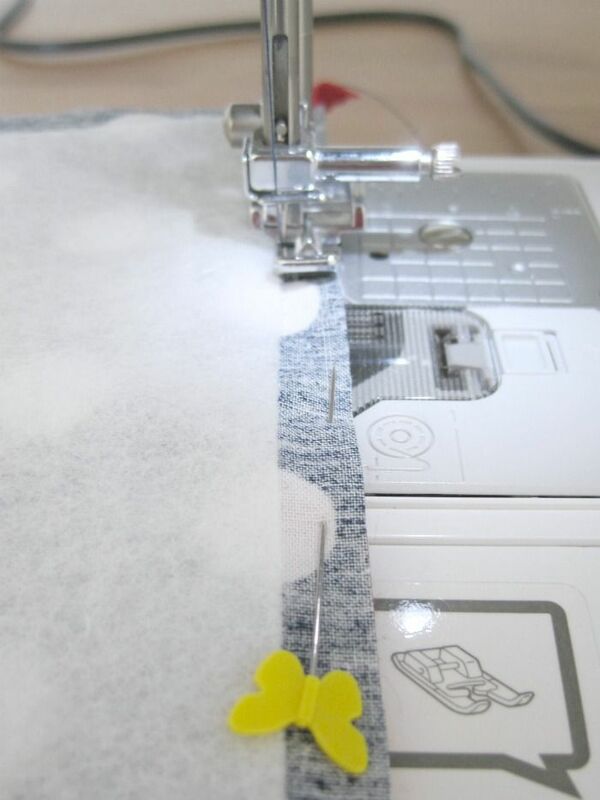 Tip: Save the paper backing from your fusible vinyl to use to iron the vinyl later. 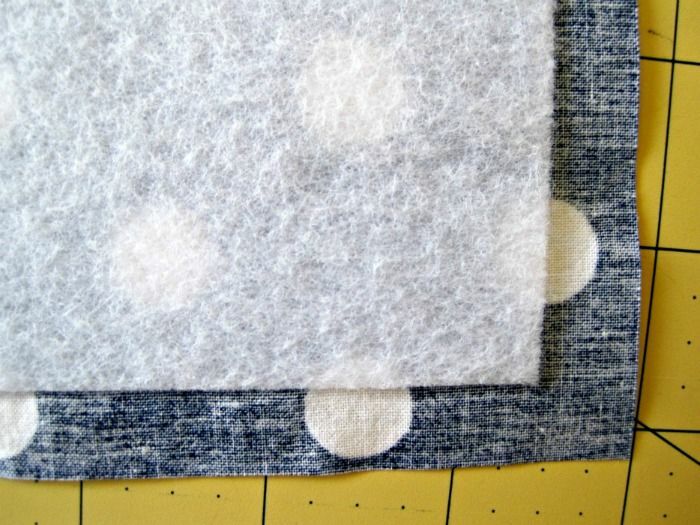 Cut a piece of fusible fleece the same size or slightly smaller than your exterior fabric. I prefer to cut mine a 1/2" smaller to reduce bulk in the seam allowances. Fuse to the wrong side of your exterior fabric following manufacturer's directions. Lay the lining piece right side up on work surface with a 14" edge on top. Center the zipper right side up on top of the fabric, aligning the top of the zipper tape with the top edge of the lining fabric. 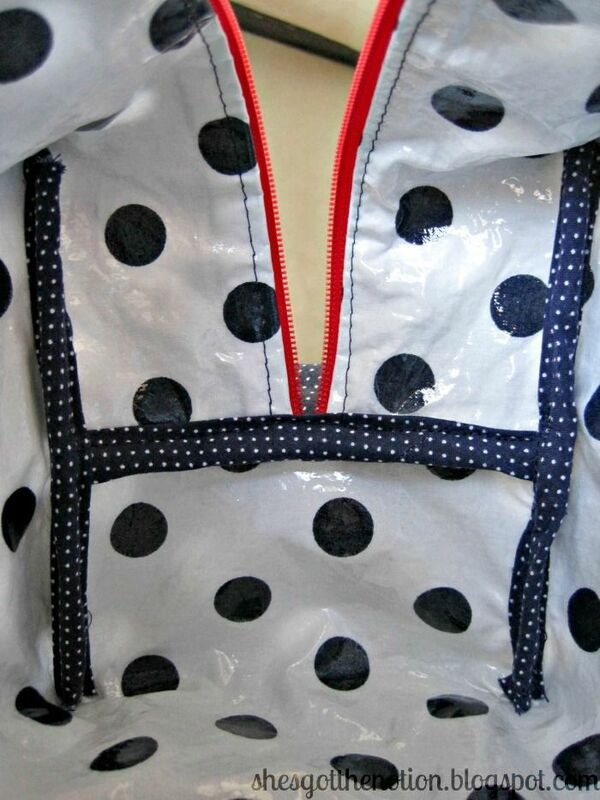 Lay the exterior fabric wrong side up on top, aligning the top edge of the fabric with top edge of the zipper tape. Pin in place. 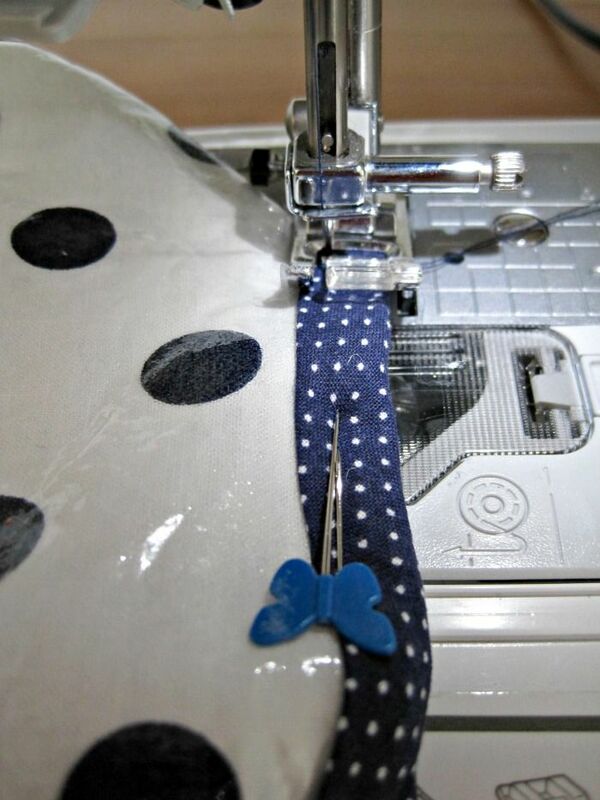 Note: Since you are pinning vinyl, make sure to only pin in the seam allowance so you don't put holes in your lining. 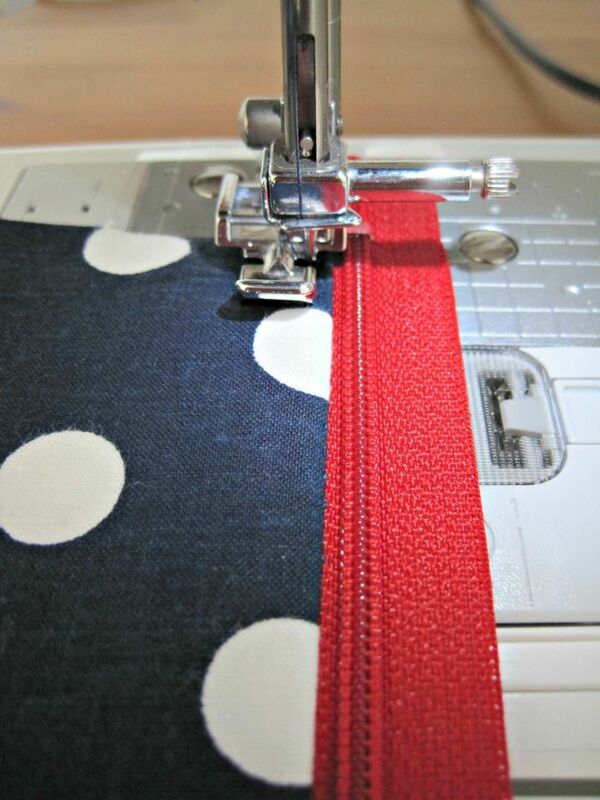 Using the zipper foot on your sewing machine, sew along the edge with a 1/4" seam allowance. 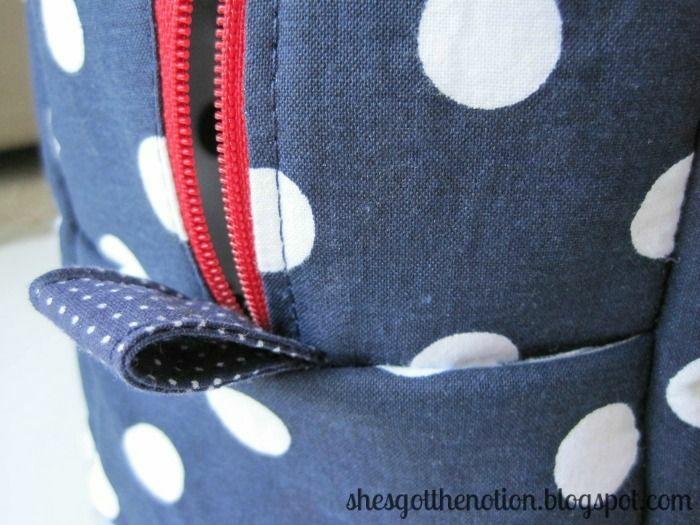 Note: If the zipper pull gets in the way, start with the zipper halfway unzipped. 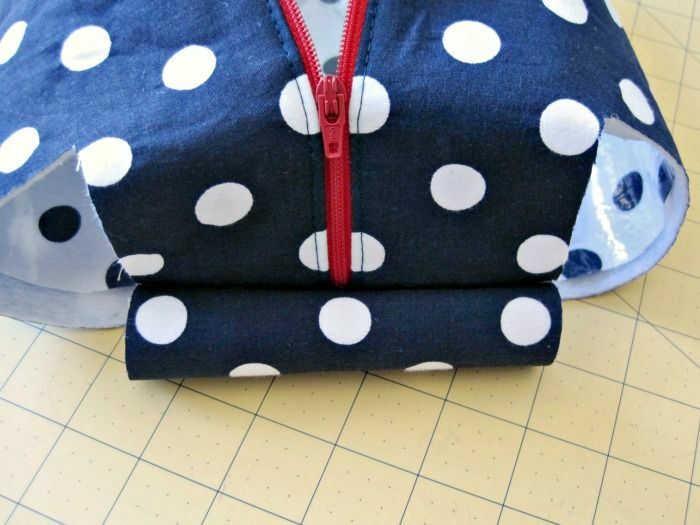 Sew until you reach the zipper pull. 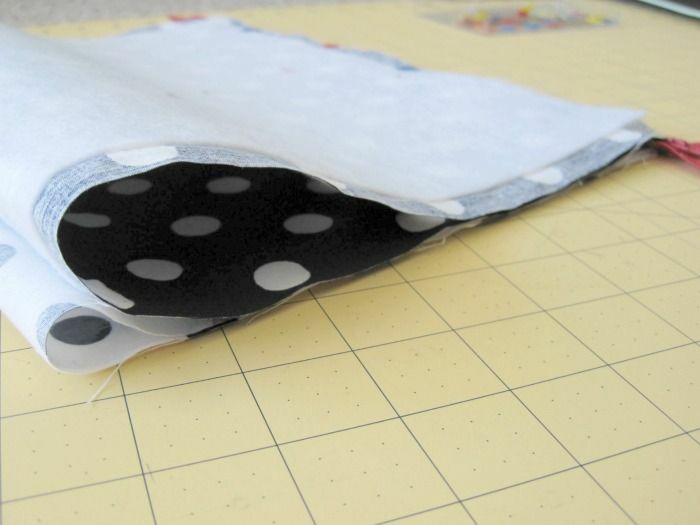 With the needle down, lift your pressor foot and carefully zip up the zipper, rotating your fabric as needed. Then lower the pressor foot and continue sewing. Press exterior fabric away from your zipper teeth. Do not touch your iron to the vinyl, it will melt it. 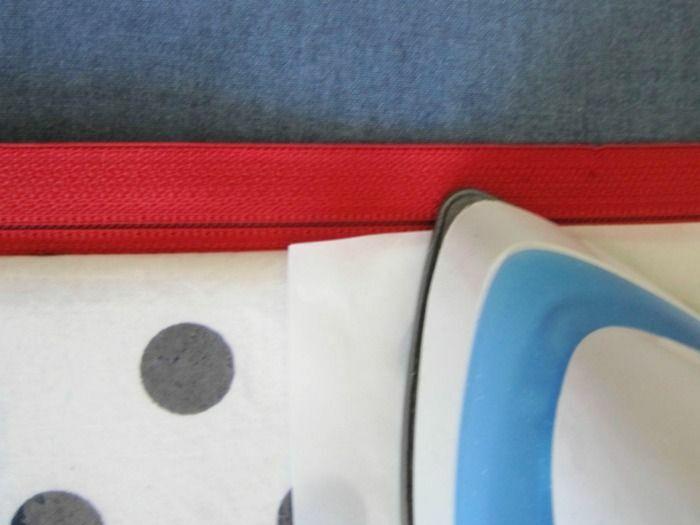 Using a lower heat setting and paper between the vinyl and your iron, lightly press the interior fabric away from your zipper teeth. Now we need to topstitch next to the zipper. Since the vinyl fabric can stick to the metal on your sewing machine, I like to use clear tape on the metal area next to the feed dogs. It helps the vinyl to not stick while sewing. Make sure you do not tape over your feed dogs! Topstitch close to the edge. 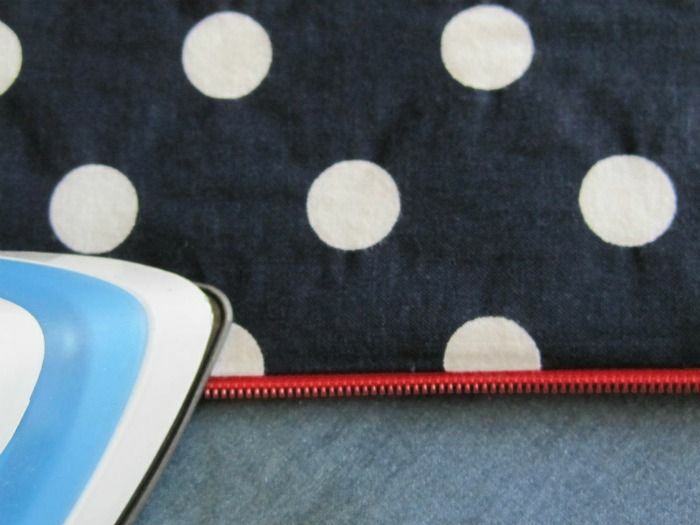 This will keep your fabric from getting caught in the zipper. Now it's time to sew the fabric to the other side of the zipper. Lay the pieces exterior side up on your work surface. 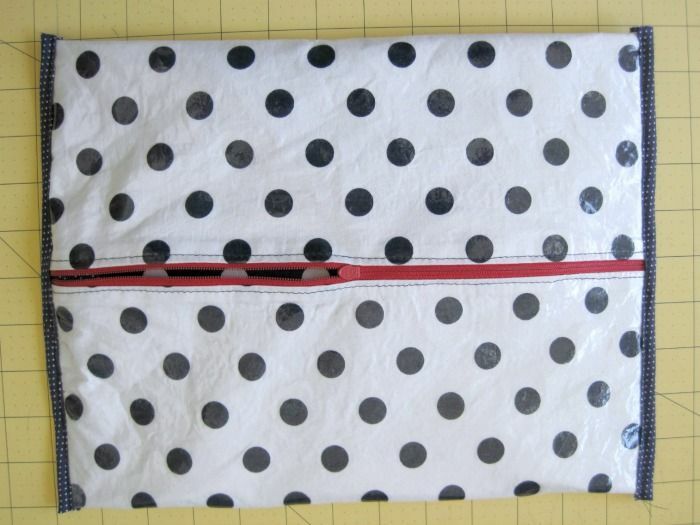 Lift up the zipper and fold up the interior fabric, aligning the edge of your interior with the edge of the zipper tape. 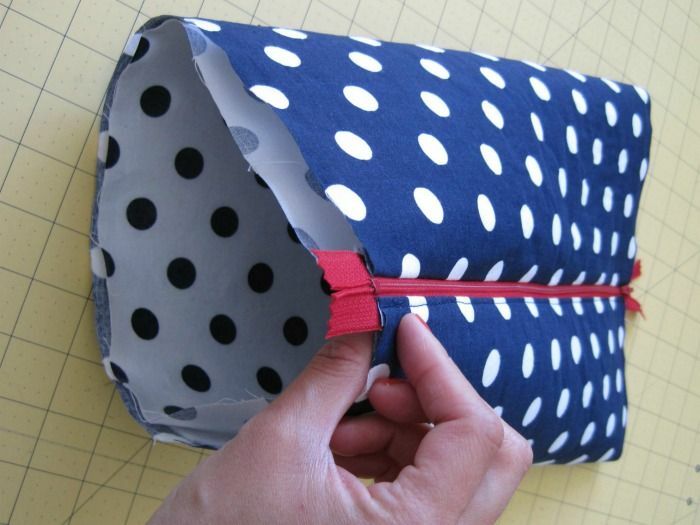 Now fold up the exterior fabric, aligning the edge of the exterior with the edge of your zipper tape. Pin along the edge. Here's what it should look like from another angle. Turn the exterior fabric right side out. Unzip the zipper and press the exterior away from the zipper teeth. Flip over and repeat with the interior side. Remember to use a lower iron setting and paper to protect the vinyl. 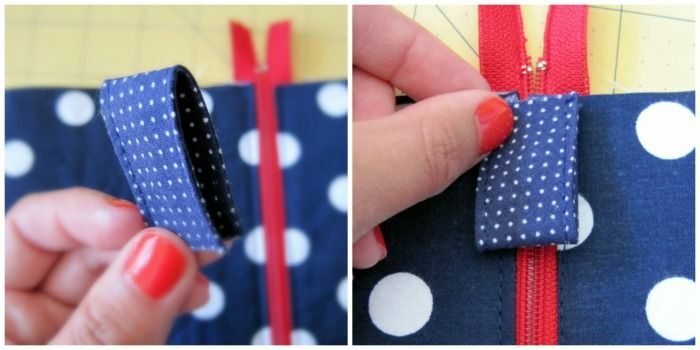 Find the 3" zipper tab you sewed earlier, and fold it in half. 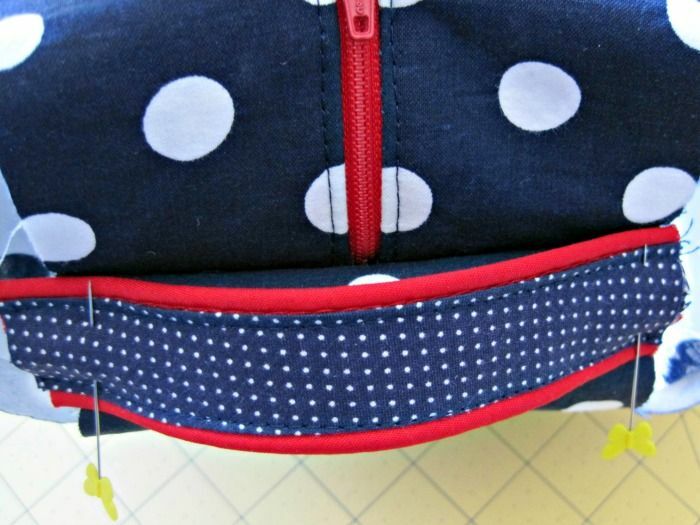 Center it on end of your zipper, where the zipper pull is when closed. 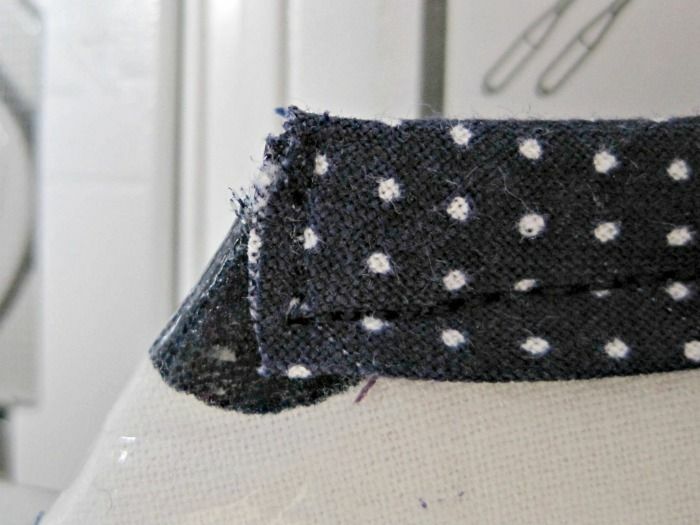 Align the raw edge of the zipper tab with the raw edge of the fabric. Sew in place over the zipper. NOTE: This picture is incorrect. It should be showing the vinyl side facing out. Turn your bag so that the interior vinyl is facing out. 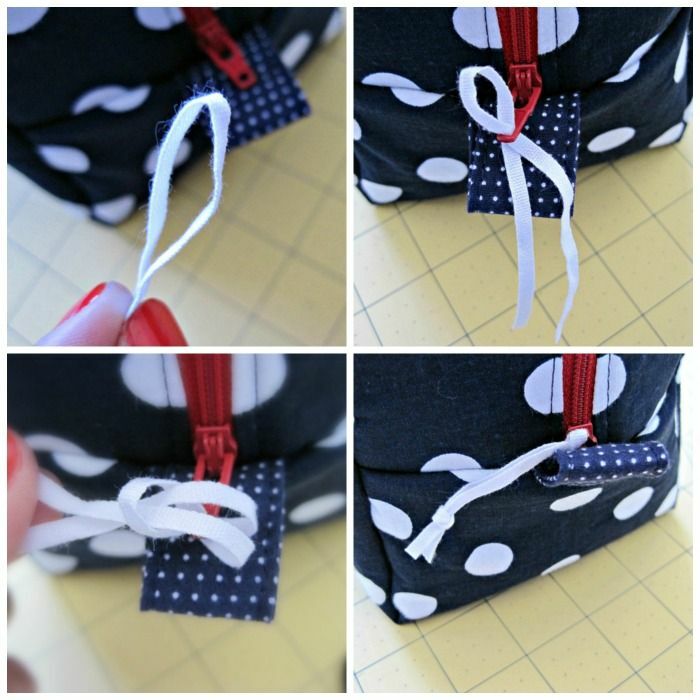 Cut off any zipper or zipper tape that sticks out past the raw edge. 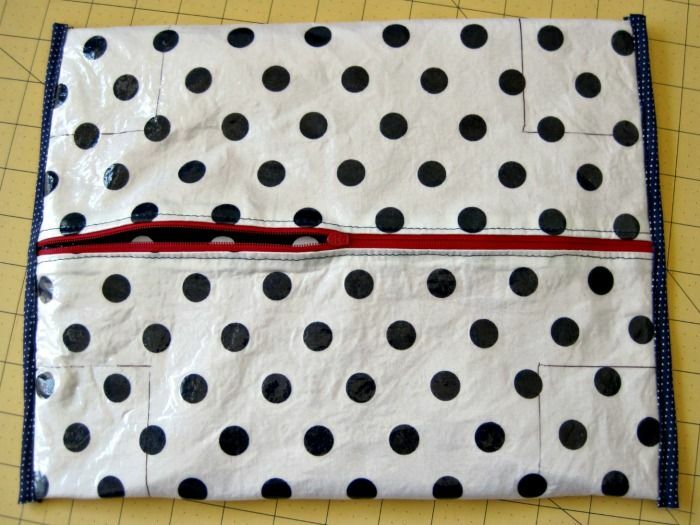 Using a clear ruler, center your zipper in the middle. 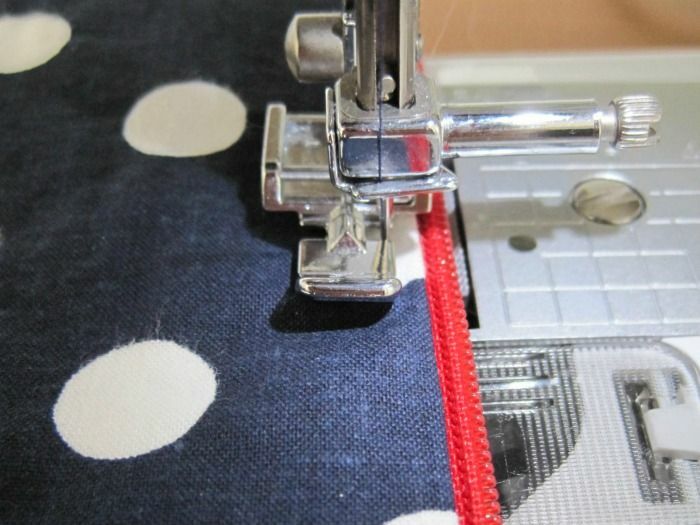 Tip: If you need to cut through zipper teeth, do not use your sewing scissors. This can damage the blades. I like to use a cheap but sharp pair of regular scissors to cut zippers. 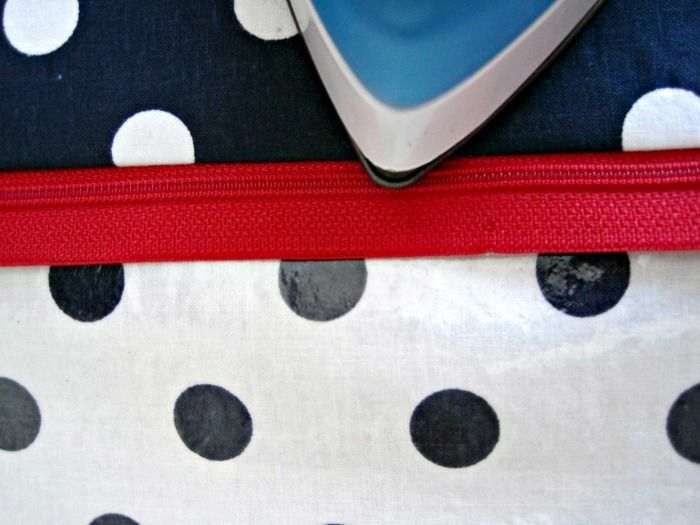 Here's where if you hate to and/or are too scared to sew vinyl you will thank me. I don't have a teflon or rolling foot, and the taping the pressor foot doesn't work for me. So I figured out a way to finish the seams without sewing directly on the vinyl. 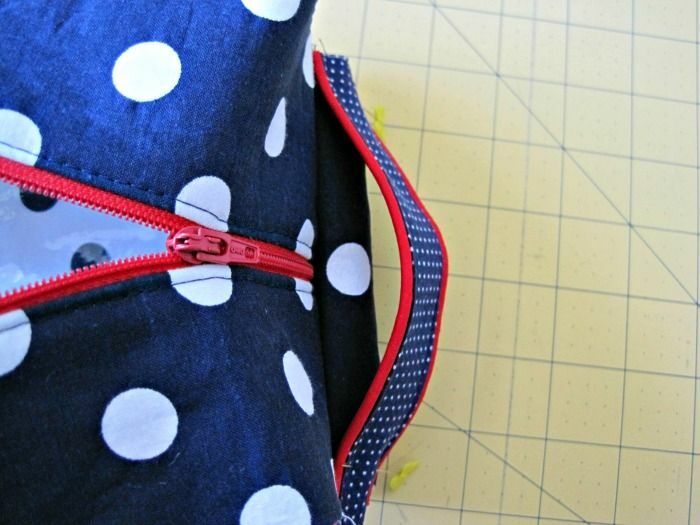 Make sure your zipper is halfway unzipped, and leave it like that the rest of the project. 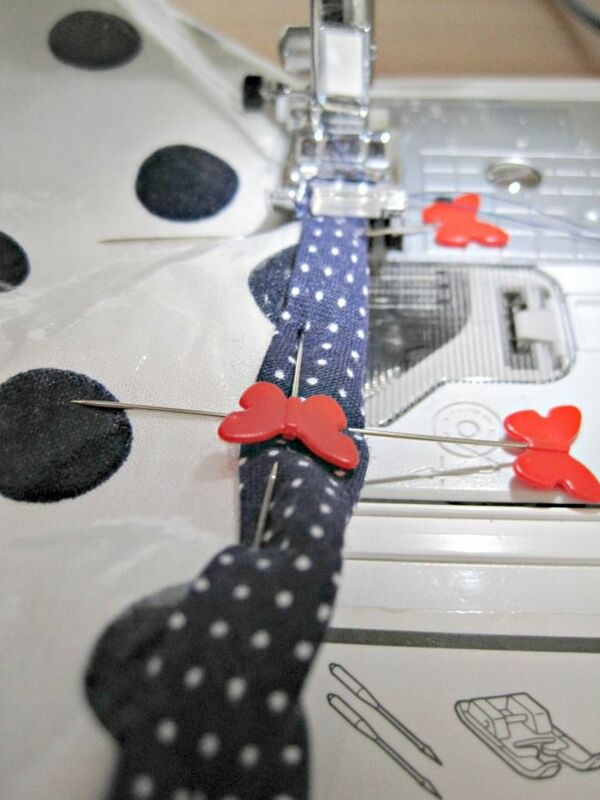 Pin a strip of double-folded bias tape over the raw edges. Make sure to only pin along the bias tape (you don't want holes showing on your lining). Sew along the inner edge of the bias tape. Pin and sew the bias tape to the other side. 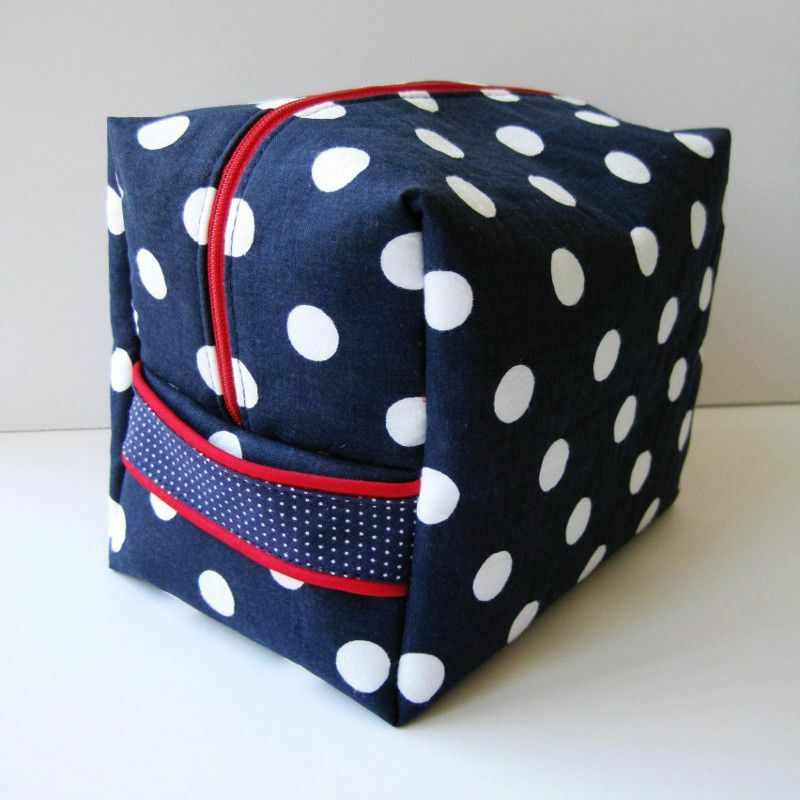 Now it's time to give our cosmetic bag the boxy shape. In each corner, draw boxes that are 2.5" away from the edges. Note: To make your bag shorter and wider, cut smaller boxes. You can test the finished size after you cut it. You can always go smaller and cut off more later if you're unsure. 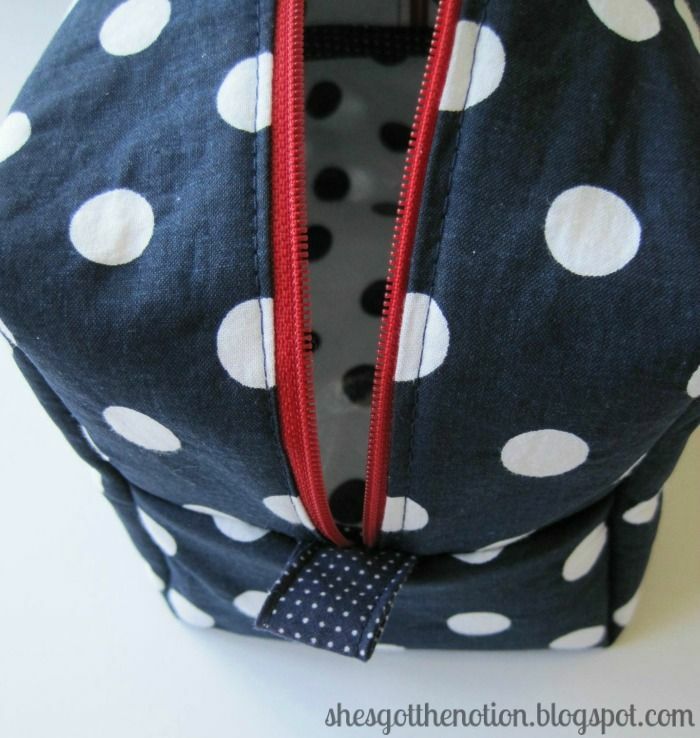 Turn your bag so that the exterior fabric if facing out. Find the end of your zipper that does not have your zipper tab. 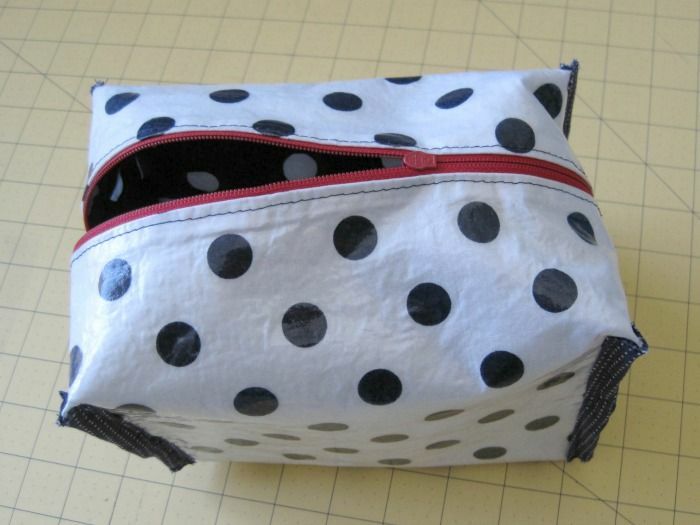 Note: Now is when you can get an idea of the final shape of your toiletry bag. 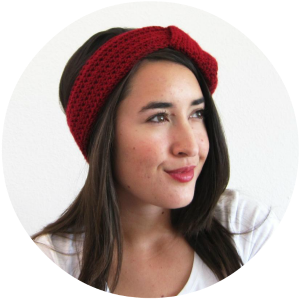 Remember the final size will be about 1/2" smaller due to seam allowances. Find your handle piece. Pin in place right below the zipper, aligning the top right below the side seam and matching the raw edges. It will stick out a bit, but it will "shrink" in once the bag is sewn. Sew handle in place close to the edge. Turn your bag so that the interior is facing out. Now it's time to box the corners. 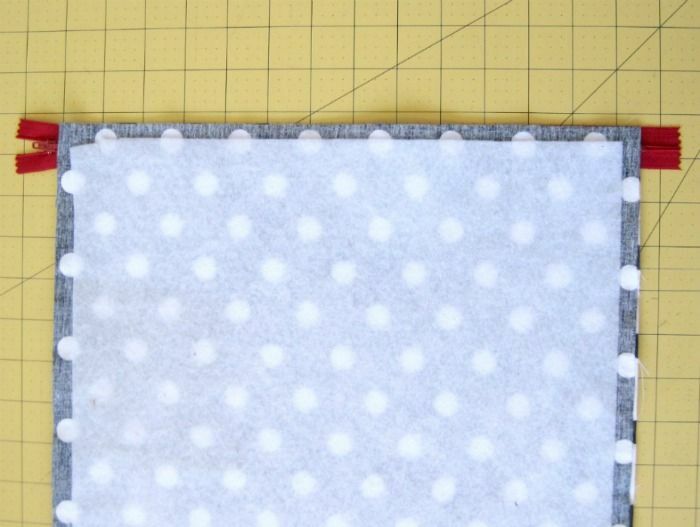 Pinch the two cut corners in, like shown, aligning the bias tape finished edge in the middle. Hand baste the seam closed a 1/4" from the edge, sewing the bias tape finished seam pointing down away from the zipper. Be sure all exterior and interior edges are lined up at the edge. If you don't want to hand baste, you can machine baste instead. Just pin well first, and go slow. Note: Since we are sewing together several layers of fabric, batting and vinyl, basting will make it so the layers don't slip while sewing. Place bias tape over the basted edge. Pin in place in the seam allowance. I used extra pins around the handle to help keep everything in place. Sew along the edge of the bias tape. I sewed up the ends of the bias tape to help keep the layers enclosed. I left the bias tape edges raw since the seams were already bulky enough, and, since it's cut on the bias, the edges won't fray. You won't be able to see the edges once it's turned right side out anyway. 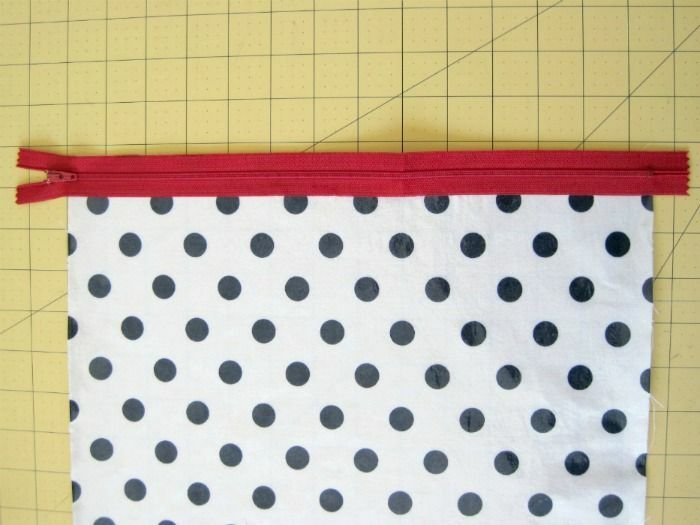 But if you'd prefer, you can tuck the edges of the bias tape under before sewing. 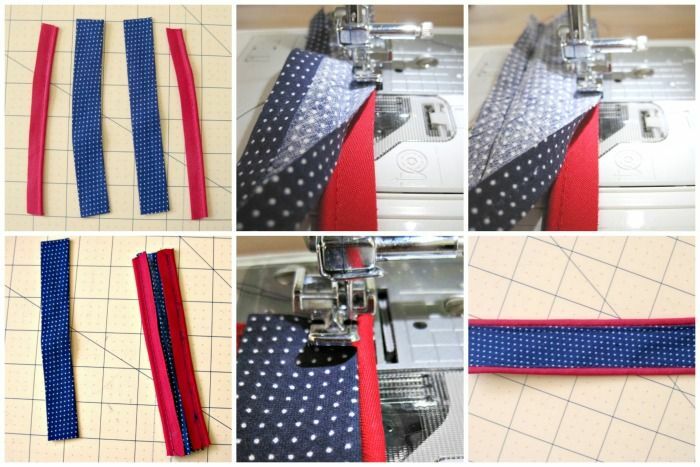 Take an 1/8" piece of ribbon of twill tape that is 4-5" and fold it in half. Pull the loop end halfway through the eye of the zipper pull. Now insert the ends through the loop and pull tight. I tied my ends in a knot, but you can leave them loose. 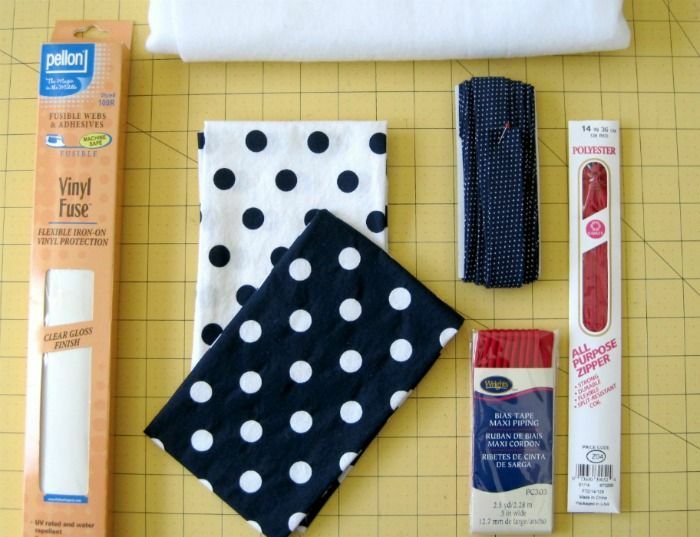 You can finish the edges of the ribbon with Fray Check or another fabric sealant. But I just use a dab of clear nail polish on the ends to prevent fraying. 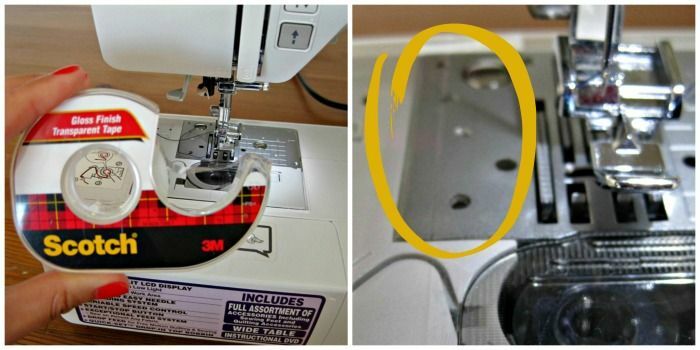 Be sure to take the tape off of your sewing machine so it doesn't leave a residue. Fill it up with your toiletries. I'm sure they'll love their cute new home. 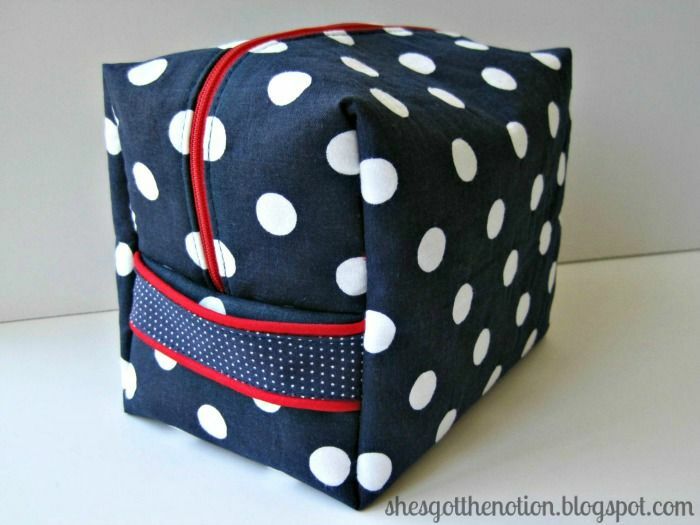 If you make a bag using this tutorial, I'd love to see it! Leave a link in the comments below, or share it on my facebook or twitter. I'm working on the second project for the fat quarter series using the remaining fabric from the fat quarter bundle. 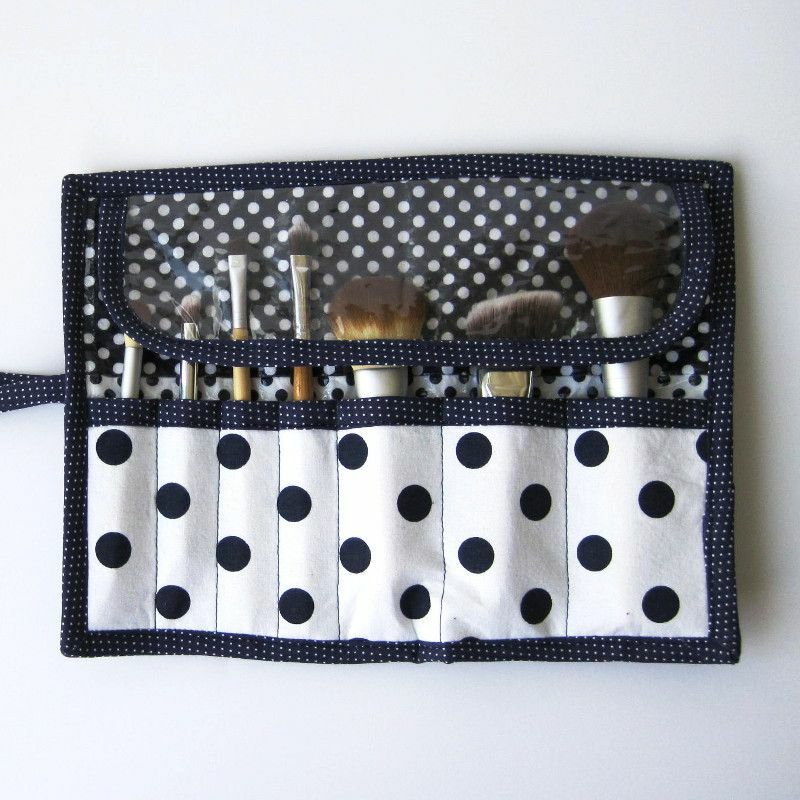 I'm an very excited for my matching set of travel toiletry and make-up pouches. Stay tuned! Thank you for this tutorial! I am making the items in the series as a graduation gift for my oldest granddaughter, I hope she likes it as much as I do. Your link for making the bias tape doesn't work correctly. The link brings me to "http://www.shesgotthenotion.com/2014/05/fat-quarter-series-bias-tape.html%20target=" You can edit the link and remove the "%20target=" at the end to get to the bias tape tutorial. I'm glad you like it! I hope your granddaughter can get a lot of use out of the set :). Thanks for letting me know about the link. It's all fixed now! Hello! I'm excited to give this bag a try. I have never used fusible vinyl before, I was at Joann's and they told me there was no such thing! I was wondering where you got yours? Thanks for the awesome tutorial! As a beginner at sewing this project was a bit intimidating but I'm very happy with how it came out!! As a beginner sewer I found this project to be a bit intimidating but was surprised with just how easy it came together!! I'll definitely be making the rest of the items on this series!! I'm so glad you found the tutorial helpful! I just want to say that this is the very best tutorial I could find on the internet for this type of bag, and I REALLY appreciate it! 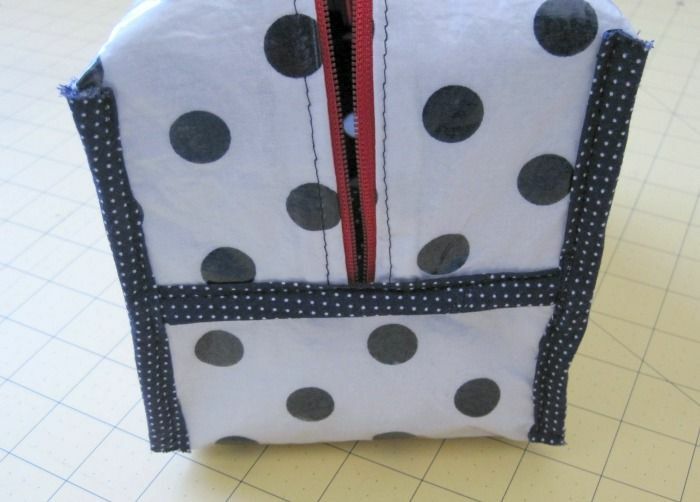 Hi, if I had regular vinyl (non fusible) could I just sew that to the interior fabric and then continue with the zipper and rest of the instructions? Nice tutorial. This is very useful. Thanks for sharing. 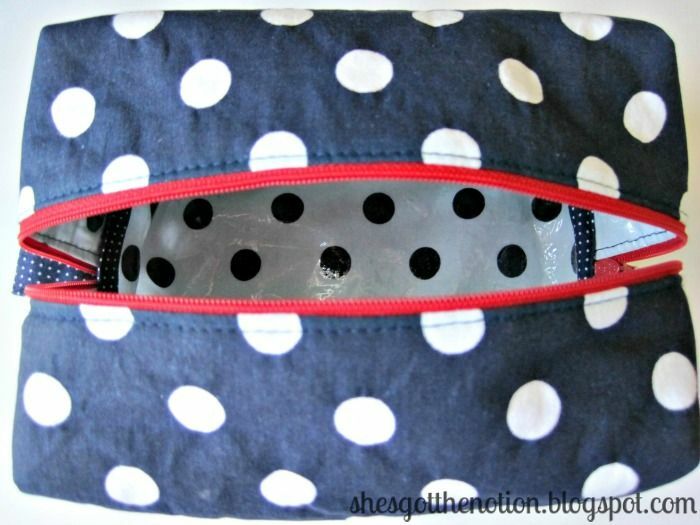 Thanks for sharing this cosmetic bag making tutorial. I am trying it now. came across your site strictly by accident and so glad i did. really enjoyed going through your tutorials, especially the fat quarter travel set. i have a sister-in-law that has just completed her chemotherapy for cancer. this is the third time she has had cancer in three different areas of her body. this time was quite a blow as she was so sure she had beaten it for good. her only desire is to go on a trip "in case it's the last one". i'm going to start immediately on a set for her to take with her on her trip when she is strong enough to go. thank you for the tutorial. Thank you for the comment Sandi! I'm sure your sister-in-law will appreciate the set you will make for her. She sounds like a fighter and she's lucky to have people like you in her life to be there for her.